(Nanowerk News) Strange but true: the recently restarted Large Hadron Collider, the most powerful accelerator in the world, is the direct descendant of Thomas Edison’s light bulb. The light bulb was invented before electrons were discovered but nevertheless led to the first vacuum tubes, which for a long time were the principal means of accelerating and controlling charged particles in radios, medical x-rays, and other practical applications. The late 1920s saw a burst of inventions intended for science. Cockroft and Walton’s voltage multiplier and Van de Graaff’s generator were powerful accelerators, but limited by the need to store an enormous electric charge. It was Rolf Widerøe’s design for a linear accelerator, or linac, enclosed in a segmented vacuum tube and designed to accelerate sodium and potassium ions (more massive and conveniently slower than electrons), that pointed Ernest Lawrence to a high-energy solution. Although vacuum-tube accelerators stayed around and continued to evolve for decades in radio, television, computer technology, and other fields, scientists who called themselves accelerator physicists pursued higher energies with mightier machines … until, one day, accelerators came to a fork in the road. It had already occurred to scientists that this light might be worth something for its own sake, but the first machine conceived and designed specifically for the production of synchrotron radiation didn’t come online until 1974. In a typical synchrotron light source, light comes from electrons moving through a simple bend magnet. The brightness is usually boosted by “insertion devices,” however — trains of dipole magnets called undulators or wigglers, whose poles alternate north and south to make the electrons slalom back and forth. The resulting light – x-rays, ultraviolet, and a wide range of lower frequencies – continues along the straight path of the insertion devices and is taken off at a tangent to the storage ring through beamlines that end in experimental stations. Here the light can be used to resolve protein structures, investigate chemical reactions, and analyze the atomic-scale properties of materials, among many other investigations. Light sources rapidly emerged as vital tools for scientific research. Within the light-source community, advanced accelerator methods have continually aimed at producing light that is brighter and comes in shorter pulses, and whose frequency, polarization, pulse length, repetition rate, and other variables are readily tunable. Dozens of beamlines issue from the electron storage ring of the Advanced Light Source. 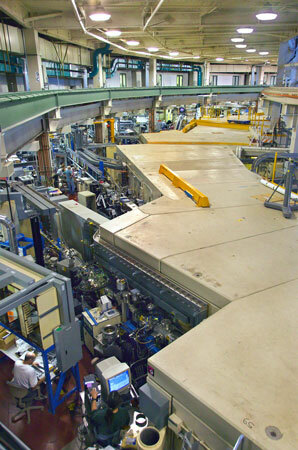 For over fifteen years the ALS has been in the forefront of synchrotron light sources providing soft x-rays for a uniquely wide range of scientific endeavors. Progress has been so rapid, in fact, that synchrotron light sources are approaching the limits of what they can achieve in the way of short, bright pulses. For that reason, Falcone, John Corlett, and other creative scientists in the Lab’s ALS, Accelerator and Fusion Research (AFRD), and Engineering divisions are developing the technology for a new light source, of a kind known as a free electron x-ray laser. Like all lasers, a free electron laser (FEL) emits amplified coherent light, although the lasing medium is not a solid, liquid, or gas but rather the accelerated electrons themselves. In the technique called Self-Amplified Spontaneous Emission (SASE, pronounced “sassy”), emitted photons catch up and pass the electrons ahead of them in the beam, herding them into tight bunches. The undulator’s alternating magnets are spaced so that the photon wavelength and electron undulations are periodically matched in phase even though they are traveling at different speeds; thus each emission further amplifies the energy of the FEL light pulse, which can reach many orders of magnitude greater energy than that of a pulse from a synchrotron. A number of FEL-based light sources are under construction or already in operation around the world, such as the Linac Coherent Light Source (LCLS) at the SLAC National Accelerator Center, the world’s first x-ray laser, and the soft x-ray Free-Electron Laser in Hamburg (FLASH) at Germany’s German Electron Synchrotron (DESY); FLASH is a pilot program for the hard-x-ray European XFEL scheduled to begin operation in 2014. Meanwhile scientists in Berkeley Lab’s AFRD, ALS, and Engineering divisions are designing a unique new kind of light source that would outstrip the performance of any other soft x-ray FEL machine now in the works. At the heart of the Next Generation Light Source (NGLS) would be a superconducting linac operating in continuous-wave mode, allowing the repetition rate of electron bunches to be up to a million times greater, and beam power a thousand times greater, than existing linac-based light sources. Synchrotrons, being roughly circular, can accommodate a great many beamlines, but a linac’s one-way electron beam can be switched between several undulators, each a FEL tailored for different experimental needs. The NGLS would feed up to 10 FELs, each of which could supply x-rays to two or more beamlines. Another FEL might have less intensity but be capable of pulses a thousand times shorter, measured in mere attoseconds (quintillionths of a second) – with the ability to provide a pair of these ultrashort x-ray pulses at different wavelengths (“colors”) and controlled separation between the pulses, an important capability for x-ray pump-probe experiments. The NGLS contemplates producing millions of electron bunches per second in a continuous and uniform stream. (Today’s best x-ray FELs are limited to 10 to 100-plus bunches per second.) The capacity for very high repetition rates ultimately resides in the injector and electron gun at the front end of the linac. “You can’t improve the fundamental beam quality after the beam has been generated,” says John Corlett, who heads the Center for Beam Physics in AFRD. “So the performance of the whole machine depends on the quality of the beam generated by the injector and source – the electron gun.” Here the NGLS would outperform any existing or planned machine. In the gun, a small, circular photoemission cathode gives off shaped bunches of electrons when hit by a pulse from a dedicated laser; the laser pulse rate determines the pulse rate of the electron bunches. The electrons are then accelerated by a strong, low-frequency electric field before entering the injector and the superconducting linac. A prototype of the electron gun is being built for testing at a dedicated facility at the ALS. One challenge is to choose the right material for the photocathode, one that produces a high ratio of electrons to photons in a tight beam and holds up under continuous use at very high repetition rates, in a high accelerating field. Timing and synchronizing the many components of an NGLS , including its photocathode laser, is a problem facing not just light-source designers but other accelerator designers as well. Widely separated components – up to a kilometer or more – must be synchronized to femtoseconds, an interval in which light travels only a third of a millionth of a meter. Berkeley Lab scientists lead in designing systems that use light frequency, not speed, to provide a master clock. Using a reference laser beam and an interferometer, the researchers count the number of light waves in the master-clock beam, which travels the length of the machine through an optical fiber. Any change in the length of the fiber changes the number of interference fringes per unit length. “So we monitor the number of fringes and add or subtract length to maintain the right number,” says AFRD’s John Staples, who led the development of the synchronization system, which is already in place at Stanford’s LCLS. Not only machine components but experiments maintain synchronization by means of the master clock. Pump-probe experiments can send in a laser pulse to excite a sample and follow with a probe pulse to see what happens after some precisely timed interval, which may be as little as a few hundred attoseconds. The NGLS and the technology now being developed to build it – from electron guns to accelerator design to synchronization systems to multiplexed FELs – will not only open new frontiers of science but are scientific advances in themselves.